A case of melano-carcinoma from the surgical clinic of Prof. W. A. Douglass. Journal : The Western Lancet ; vol. xiii. San Francisco : Jos. Winterburn & Co., 1884. Description : [1 l.] pl., -146 p. ; ill.: 1 phot. ; 23 cm. Subject : Skin — Metastatic melanoma ; Paquelin thermocautery. Author caption: Operated upon by Dr. J. F. MORSE. Adjunct to the Chair of Clinical Surgery, Cooper Medical College, and Surgeon to the German Hospital. Graduated, Cooper Medical College, 1878. Elected, surgeon to the German Hospital, 1883. 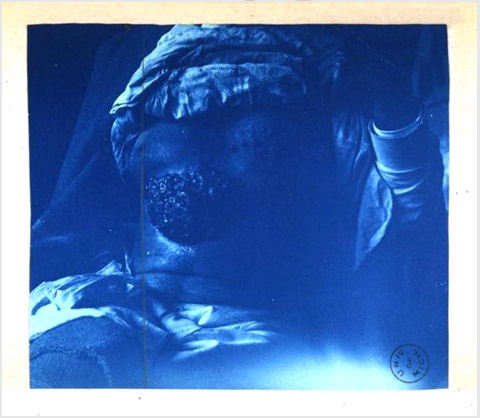 The cyanotype shows the cauliflower excresence and buds of a virulent nodular melanoma on the body of a 60 year-old male. After a course of anatomical studies supervised by Dr. William A. Douglass (1825-1890) and his graduation from Cooper Medical College, Morse continued his training abroad with Czerny in Heidelberg. His reputation was established by two brilliant operations: the excision of a glioma in the brain of a patient under the care of Dr. Joseph Oakland Hirschfelder (1854-?) — the first time this procedure was attempted in the United States — and, secondly, his successful treatment of aneurism in the abdominal aorta described in a paper titled, Cure of abdominal aneurism by Loreta's method. Morse was only 41 when he died of cerebral hemorrhage.